When my husband and I were dating, we went to visit his grandmother. She is the sweetest, tiniest little Texan grandma you can imagine. The entire time we were there, she didn't call me by my first name once. She was so fearful that she would accidentally call me by the name of his ex (our names are very similar). I wasn't hurt by this in the least because I knew her intention was to avoid an awkward situation and potentially hurting my feelings. After some time she dropped the "hers" and "sweethearts" and "darlings" and adopted using my name. It still makes me smile to think of it. 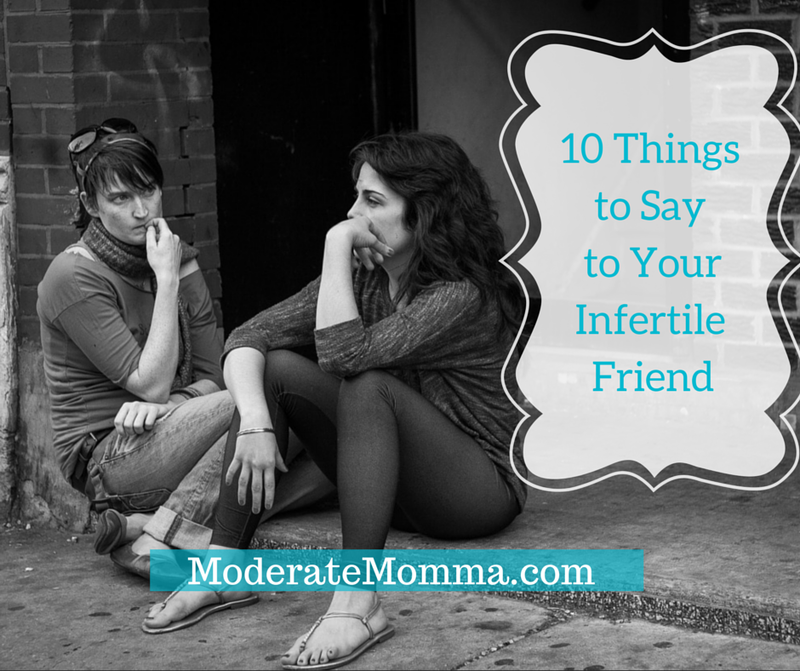 This got me to thinking, how many people have read the "Things not to say to an infertile couple" posts online and decided that rather than put their foot in their mouth, they would keep it shut? Let's face it, reproductive issues and infertility can be a bit of a tricky minefield. I'm thinking of you/praying for you during your treatment. I'm excited for your future! You will be an awesome mommy/parents. Do tell your friend when you are expecting, but deliver the news in email so they can deal with the emotions privately. We're happy for you, but it still hurts and reminds us of our scars. Bottom line, just start talking. Be honest and reach out to the ones you love who are struggling. Infertility impacts 1 in 8 couples of reproductive age and can be a very isolating disease to face. If you aren't in the trenches of this fight, 1 in 8 is someone you know. If you are one of the 1 in 8, know that you are not alone. RESOLVE, the national infertility association, can provide support and resources. They also work tirelessly on behalf of the infertility community to bring awareness to the disease and educate our legislators and insurance companies. I'm here too! Contact me if you need an ear, or have questions that you aren't comfortable posting. I am so thankful that we live in an age where there are multiple family building options available and hope that all the parents-to-be find their path. I absolutely love this post, sharing it on Twitter! I would like to share my personal experience in this field. Some time ago I was ready to give everything for the opportunity to become a mother. Biologically I am now my baby mother. I have no eggs and due to cancer and I lost my uterus. I had no variants. Since I am from Hungary surrogacy is illegal here. We started looking for variants abroad, here a cost varies greatly. After reviewing a large number of clinics, we contacted native iyabasira native clinic They offered an ‘all inclusive’ package that we were very happy with, as we were only focused on winning. And it is much cheaper than somewhere else and we were surprised with conditions and attitude to us. After 1.5 years we became parents. And it is pricelessly. this is mother iya herbs works, email info (nativeiyabasira@yahoo.com) In such cases her herbs is a real solution to become a happy mum.